Monitoring the battery consumption in a laptop is something most owners do. The tool in Windows to check your laptop battery is pretty decent if you just want to check how much juice the battery currently has and has the two power options so you could change it. But if you want to get more information of your laptop battery to optimize it and improve performances you should download BatteryCare. With BatteryCare you can find much more information of your laptop battery than you would in Windows stock battery tool. BatteryCare monitor the battery’s discharge cycles. You can also see the current battery capacity, battery remaining time, and battery status, as you would see in Windows default battery tool. Batterycare also give you complete details of your battery such as the designed capacity, manufacture, voltage, wear level, etc. With BatteryCare you can also activate power plans automatically for conditions you set it up either when the laptop is plugged or on battery unplugged. In addition to those features, this program also shows the CPU and hard drive temperature of the laptop. In it settings, it also gives you the option to disable Aero theme when the laptop is on battery mode. 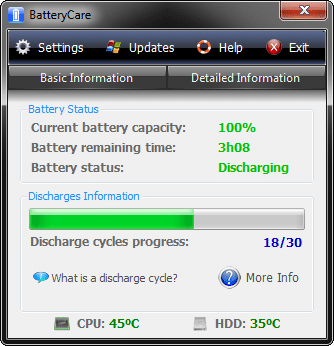 You can download BatteryCare for Windows 7, XP, and Vista at batterycare.net download page for free.